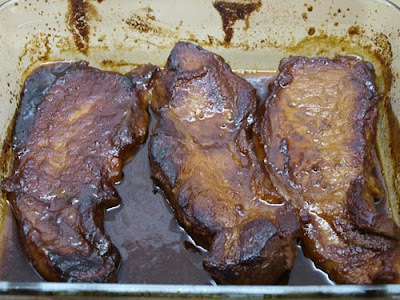 Farmersgirl Kitchen: Easy Barbeque Pork Chops without a BBQ! Easy Barbeque Pork Chops without a BBQ! Long ago and far away, before home computers (let alone the internet!) and when my cookbook collection was counted in tens rather than hundreds, I used to borrow books from the library and hand write the recipes I liked into various notebooks. 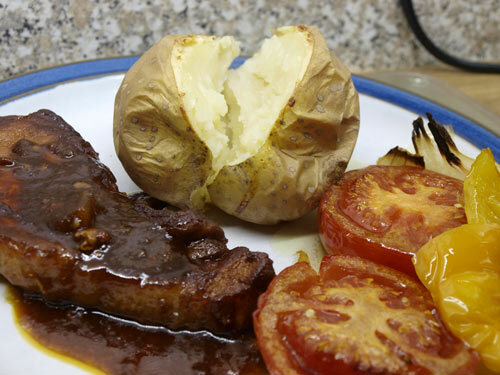 I was looking for a nice easy recipe for some pork chops and remembered this one, it is quick, easy and tastes fantastic. If you look carefully, you will see that it is a Mary Berry recipe, but unfortunately I haven't said which book it is from and as I probably wrote this out in about 1981 I certainly can't remember. You can always tell a good recipe from the splatters on the page and of course my own 'star' system where I award recipes up to five stars and this is definitely a Five Star Recipe. 1. 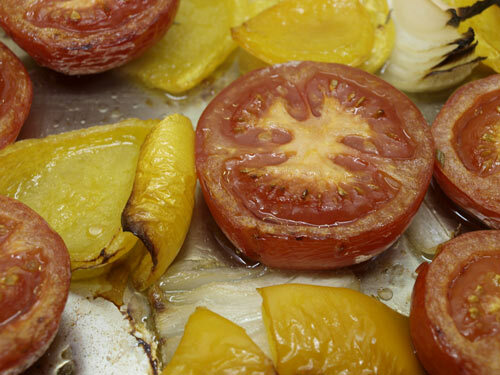 Put Chops in a non-stick frying pan and heat gently until fat begins to run.2. Increase heat and fry quickly for about 10 minutes until browned all over.3. 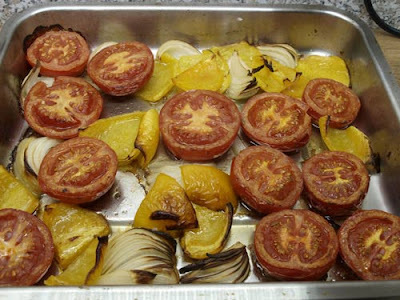 Arrange in a shallow ovenproof dish.4. Mix remaining ingredients and pour over chops, cover dish with foil.5. Cook at 350F/180C/Gas 4 for about 1 hour or until tender. Here are the baked chops swimming in their delicious sauce. I notice that the book says to serve with garlic bread and salad which would be great, but I served it with baked potatoes and roasted vegetables which we certainly enjoyed. I do love roasted vegetables and the fact that you just chop them up and throw them in a roasting tin, pour over some olive oil and bung in the oven at 200C for around 30 minutes or until they are soft and singed around the edges. Oh look how sticky and caramelised and tasty those chops look. Apricot jam, eh? I am new to Mary Berry - didn't know much about her until the first GBBO. I do like your organised copying out of recipes form library books. I'm hoping my blog will be my vehicle for keeping a note of good recipes from library books now but sometimes you do still need to just write something down in a notebook even nowadays. I really can't get the hang of using my iphone calendar or anything like that - I still need to have my handwritten diary and I'm resisting any changes away from that. Let's see how long I can last? 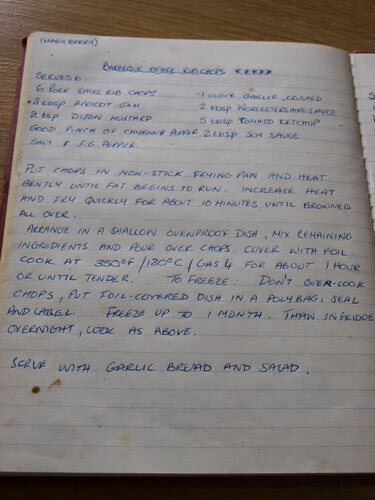 This post has made me very nostalgic for my old handwritten notebooks with their (usually) carefully recorded recipes. I think I've still got 3 or 4 of them from the 80s and I must dig them out. I have a feeling that I'll find recipes reminiscent of this one in them and that's no bad thing. It looks delicious. You and me both Janice ~ I have an exercise book or three with recipes in them, all carefully copied out....I LOVE your wee book! The recipe looks fabulous too and the photo is great. A lovely recipe :) The sauce really sounds lip-smacking delicious. Yes, no more handwriting recipes. I am making ground on transferring my favorites to the computer and eliminating hard copies. SO much easier to search for them and no more lifting the big recipe box and then refiling.